This is an extended series of images of a very small black & orange bee, with white clypeus & supraclypeal region. 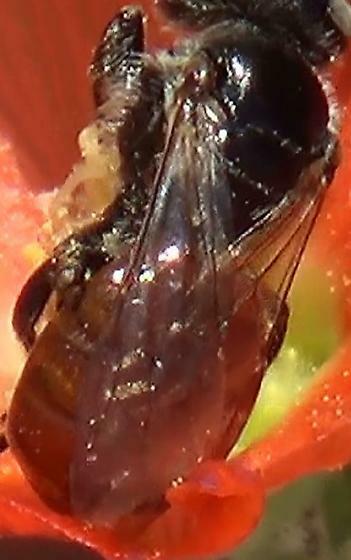 The Clypeus appears to be divided by a long black "snout", that seems to hang over it, down the center-line of the bee's face, above & slightly forward of the mandibles. This bee was filmed on three separate flowers of a Narrow-leaf Globe-mallow plant, next to the house. Yes, I have many more images, but most of them are blurry. She seems like a very close match to Perdita calochorti, but I'm awaiting the review from Dr. Ascher. Please confirm, move or frass these images. Thanks for your help!